B"H this is 5.25 Kilo (13 pound?) salmon I bought in honor of the Festival of the Splitting of the Sea. It cost aprox. $57 which is the numerical value of the Hebrew word "zun" - to give food and sustenance (449.34 ukranian grivna). First I made the trek to the major supermarket (maybe a fifteen minute walk) with about 200 grivna in my pocket, but they told me that the smallest they had would be in the 400 grivna range, so I was making my way out of the store empty handed when someone asked me if I wanted to change money - and there was the little miracle - I traded in $30 for another 240 grivna, and went back for the fish. So they put the fish on the scale and it came out to 449.34 - so I put together all the grivna I had spread out in all my pockets and between papers etc. and came up with 449 and tried to explain to them that I couldn't do the .34 kupeks (about 4 cents), they weren't understanding, but right then and there some guys from the holy tomb showed up and they spotted me one grivna. So B"H the fish was sran wrapped and handed over - they told me that I can only get a bag from the checkout. At the checkout they wanted a little more for the bag and I was going to do with out it but the money changer and a russian waiting in line behind me rushed to my aid with the few kupeks. 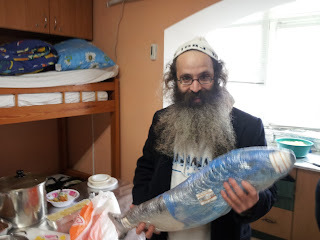 B"H in the picture I'm standing in my friends house who shared my excitement with the fish, but in the casual conversation I had with him afterwards he revealed that he had just bought one weighing over 7 kilo B"H - this friend of mine is preparing the fish for us. 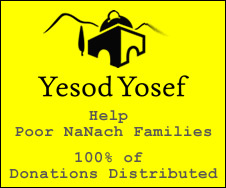 Over this passover provided the people at the holy tomb with two major sources of food (primarily meat) - one the friend I mentioned above, may H"Y bless him and protect him - who endlessly dished out good food to all who came by. This guy was brought up as a child in the old school Breslov, but B"H he is not old, he is very strong now with the Petek, there is much to say B"H.
In addition some guy from vienna I think, who's been here a few times and everytime he's not sure what it is that brings him back, was pounding out the protein and wine, matza etc. the whole festival. There wasn't the greatest vibes with this guy, may HY bless him and bring him closer to the truth and holiness. Our good friend David - the guy living on top of the Rabbi Nachman's grave for many years - also put out snacks every day - and actually started the holiday buy giving a big chocolate bar to everyone at the holy tomb (your talking maybe 60). Also our good friend Gilad - who is one of the main providers during the year, who was kind of hand tied by the need to be chumetz free, even still, managed to put out some food. So B"H there is amazing Divine Providence here at the holy tomb, where we see eye to eye how the Holy One Blessed He provides for us via His main Tzadik.